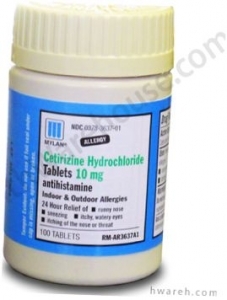 Cetirizine HCL tablets are a type of antihistamine used to relieve the symptoms of an allergic reaction. These symptoms range from itching, sneezing, congestion, and hives. Cetirizine tablets include the active ingredient Cetirizine Hydrochloride (HCL). Cetirizine is an anti-allergy medication that works by blocking the natural substance, histamine, which the body makes during an allergic reaction. What is Cetirizine HCL used for? Symptoms caused by allergies including red and watery eyes, sneezing, congestion, runny or itchy nose, swelling, rash, redness, itchiness, etc. It is important to note that Cetirizine cannot be used to treat or prevent a serious allergic reaction such as anaphylaxis. In case of serious allergic reactions, consult your doctor about what medication to use. For instance, if you’ve been prescribed an epinephrine injection to treat serious allergic reactions keep the injection with you at all times and do not take Cetirizine in place of epinephrine. What side effects are associated with Cetirizine? If any of these side effects persist or worsen, tell your doctor or pharmacist immediately. Note this is not an exhaustive list of side effects. Contact your doctor immediately if you experience any unusual side effects after taking Cetirizine. In some rare cases, Cetirizine may cause serious side effects. If you experience any one of these, stop using Cetirizine immediately and get medical help at once. Cetirizine HCL tablets are available at both local and online pharmacies. Some online pharmacies such as healthwarehouse.com can also deliver Cetrizine to the patient’s home. - if pregnant: ask a health professional before use. Adults and children 6 years & older one 10mg tablet once daily; do not take more than one 10mg tablet in 24 hours. A 5mg product may be appropriate for less severe symptoms.